The best thing that can be said for February is that it has only 28 days. It’s always been my least favourite month. So I shall be very glad when the March parish mag drops onto my doormat. Not so my husband: as he was born on 1st March, the end of February heralds that he’s aged another year. But for me there is NOTHING good about February. By contrast, what’s not to love about March? 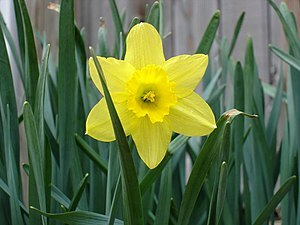 The official start of spring, daffodils, green buds on trees, primroses, lambs. Simple but satisfying traditional celebrations: Pancake Day, Mother’s Day, and the Spring Solstice. And none of them will break the bank. The Spring Solstice, incidentally, is my parents’ wedding anniversary. 21st March has always struck me as such a hopeful, optimistic date for a wedding, and it’s served them well for 58 years so far. Then at the end of the month, the icing on the cake: the clocks spring forward – the moment we’ve been waiting for all winter. But if the thought of March cheers you up, just wait till we get to April. Suddenly, it’ll feel like the summer. And I’m not talking about the weather. With so many public holidays, April will be the new August. A full fortnight off school will segue into the two Easter bank holidays, then the children will be back at school for just three days before another four day weekend courtesy of Prince William. It’s so considerate of him to book his wedding adjacent to the May Day holiday. Now there’s a man intent on restoring the Royal Family’s popularity. Well, after the winter we’ve just had, we certainly deserve a decent summer. Bring it on! Previous Post Let Blending Commence!